Home Tags Posts tagged with "Švejk"
This is actually not the first time I’m writing about Karlovy Vary, formerly known as Carlsbad. A few months ago, I wrote an article on MUNCHIES about one of the things the town is famous for: Becherovka, the herbal medication that became a liqueur without loosing its atrocious taste. But there’s more! 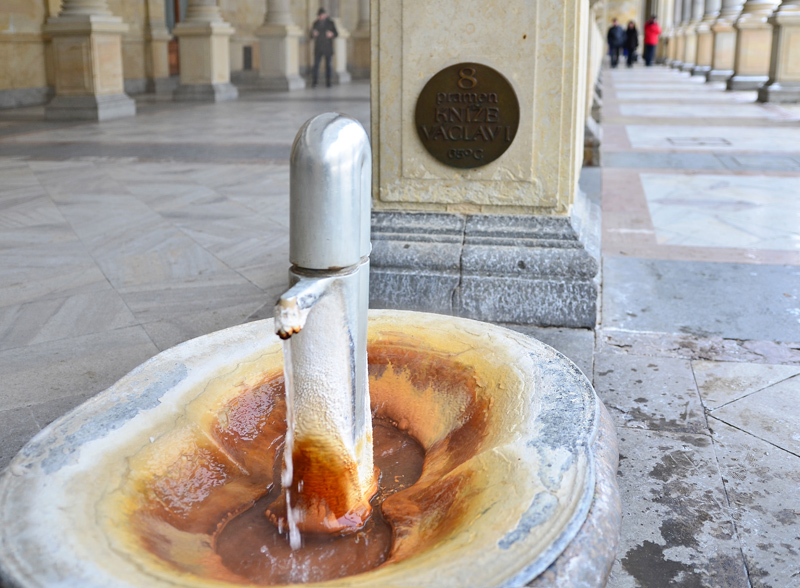 As a spa town, of course Karlovy Vary has its share of spring waters with supposed curative powers. Nowhere else will you see Russians drink water so eagerly, rushing to the fountains in the delusional hope that a few cups will wash out a lifetime of binge drinking. All this because, once upon a time, Tsar Peter the Great and various other members of the Russian aristocracy visited Karlovy Vary for treatments. Now, water is in my opinion the most boring beverage on earth — it usually has no flavor, and when it does, you wish it didn’t. But I decided to play along, and tried the lukewarm and scalding hot springs with an open mind. The box now checked, I probably won’t repeat the experience. Not only is the sulfurous taste rather gross, even if you close your eyes and think about your health, but it gave me a stomach ache that lasted all day and night. Serves me right — I shouldn’t have deviated from my water-free diet. Maybe life in Czech Republic is like a spring in Karlovy Vary: you never know what to expect, except that it will probably stink and hurt. The principle is simple: a thin layer of flavored cream sandwiched between two equally thin wafers of near-neutral flavor. The size ranges from normal (maybe 10 cm) to quite massive (double that, pretty much like a 45 rpm if you’re old enough to know what a 45 rpm looks like). 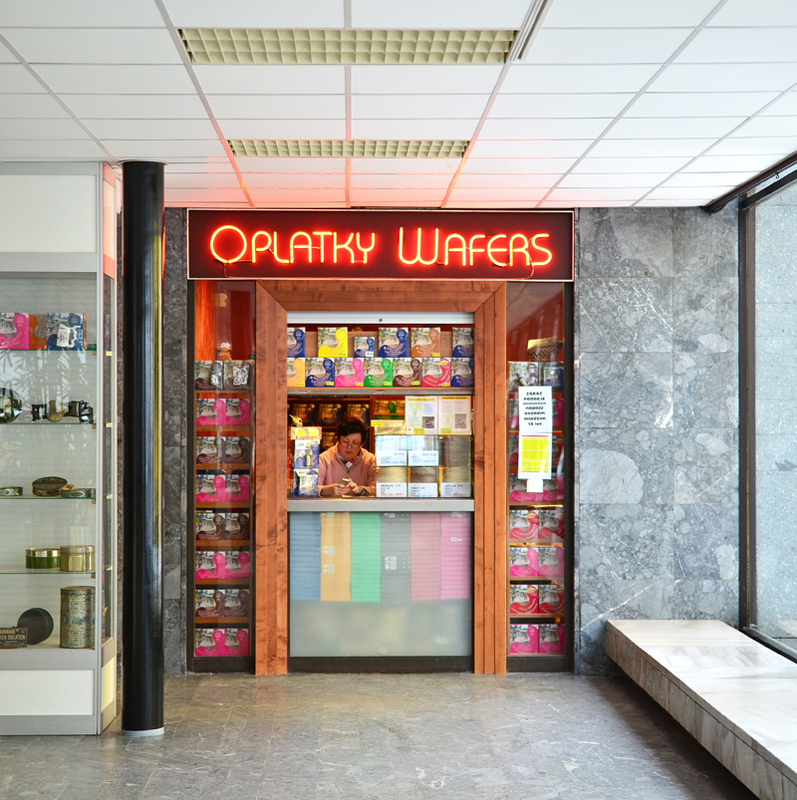 I wouldn’t necessarily go out of my way to procure them, but they’re nice, they go well with vodka, and they could even bring a touch of couleur locale and nostalgia to a modern Czech dessert. On to the restaurant scene. In a town where the whole center has been restored to its pre-communist splendor (or at least something meant to evoke same) and every other shop sells garnet jewelry, one might expect that the comfortable hotels have matching eateries. And maybe some do. 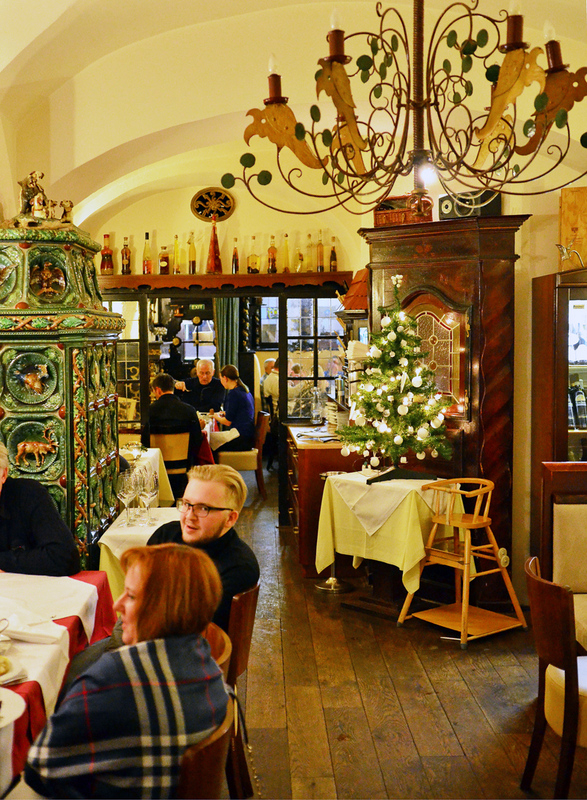 But the local food doesn’t depart much from traditional Czech cuisine, executed without zeal or creativity. Let’s start with the fancy end of the spectrum at Hotel Embassy. The dining room is certainly very nice, and I love the green-tiled stove. I’ll skip the details of their inability to take a reservation correctly and their record-breakingly slow service, though you sure should be on the lookout for both, and go straight to the food. The menu is a motley mix of international dishes, especially Italian (pasta, carpaccio, Caesar salad), seafood (lobster tail, smoked fish, salmon roe), Czech classics (duck, pork, cabbage, dumplings in various combinations), game dishes (venison tenderloin, pheasant breast), and exotic meats (exotic for Czech Republic, that is: leg of lamb, rabbit, Wiener schnitzel made from veal, bison, Argentine beef). 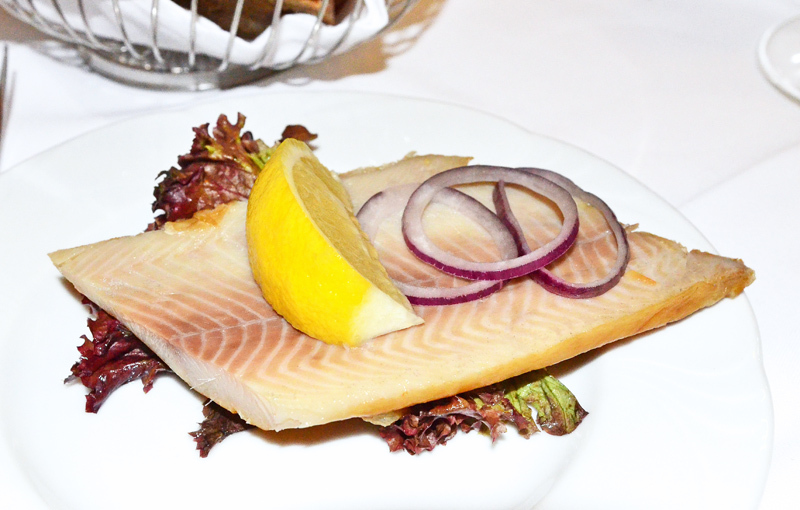 The smoked fillet of trout is just that: a trout fillet, smoked. It’s garnished with a lemon wedge and the inevitable-yet-not-so-necessary raw red onion and lettuce leaf, and served with bread and herb butter on the side. The trout is tasty, though. 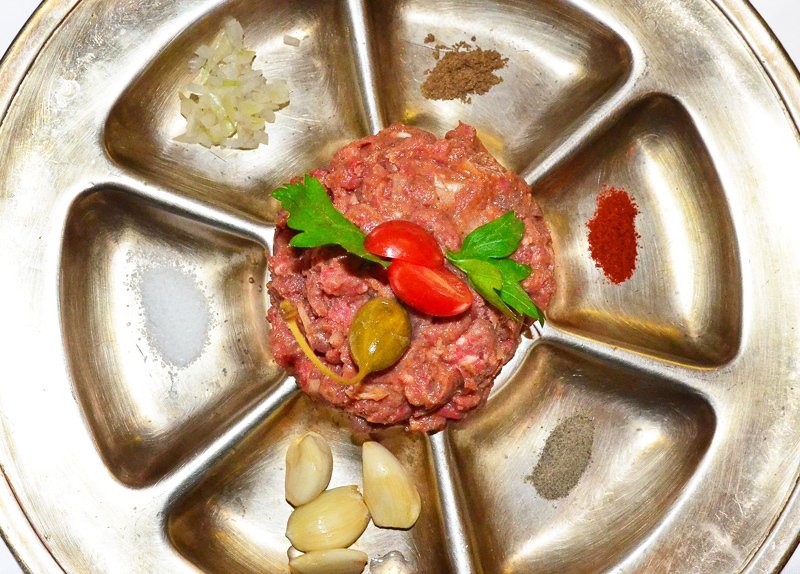 The steak tartare is just as good. It comes surrounded with all the usual garnishes: chopped onion, ground caraway, paprika, black pepper, salt, and garlic. It’s also mixed with onion (which could have been chopped more finely), Worcestershire sauce, and salt, with a slight sweet note, and served with heavily buttered toasts. I’m really loving these Czech beef tartares! Even if this time the plate does look ridiculous and totally impractical. The “breast of pheasant stuffed with bacon, red cabbage rolls stuffed with raisins, mashed potatoes au gratin, juniper sauce” doesn’t exactly scream modern cuisine. Like most dishes in Czech Republic, it’s really big, with two pieces of breast where one would suffice. The breast is a little dry and overcooked, but the extra sauce on the side helps. The cabbage rolls taste good, and are actually quite original: whole cabbage leaves are wrapped around a raisin mixture and cooked until soft. On the other hand, I’m pretty sure the mashed potatoes are made from instant potato flakes. The food isn’t bad at Hotel Embassy, it’s just not particularly inspired, and the presentation has strong 1970’s accents (the piped potato purée, the beef tartare plate, the sauceboat…). But let’s get out of Karlovy Vary’s central spa area now. 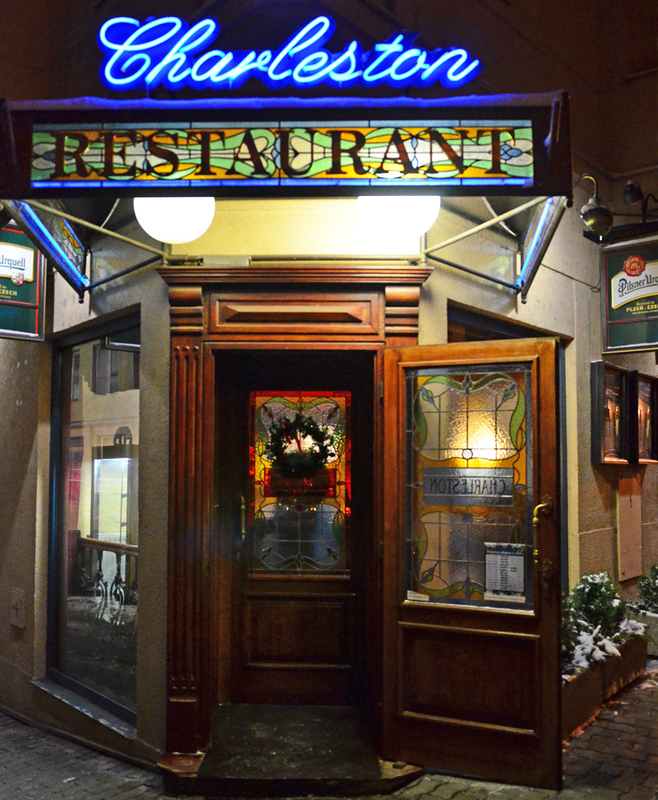 Charleston is a 1920’s-themed restaurant strongly recommended by Lonely Planet. Smoke-haters beware: not only do people smoke inside, but the restaurant also sells cigars. As with the restaurant at Hotel Embassy, the lengthy menu at Charleston professes the chef’s love for Italy. 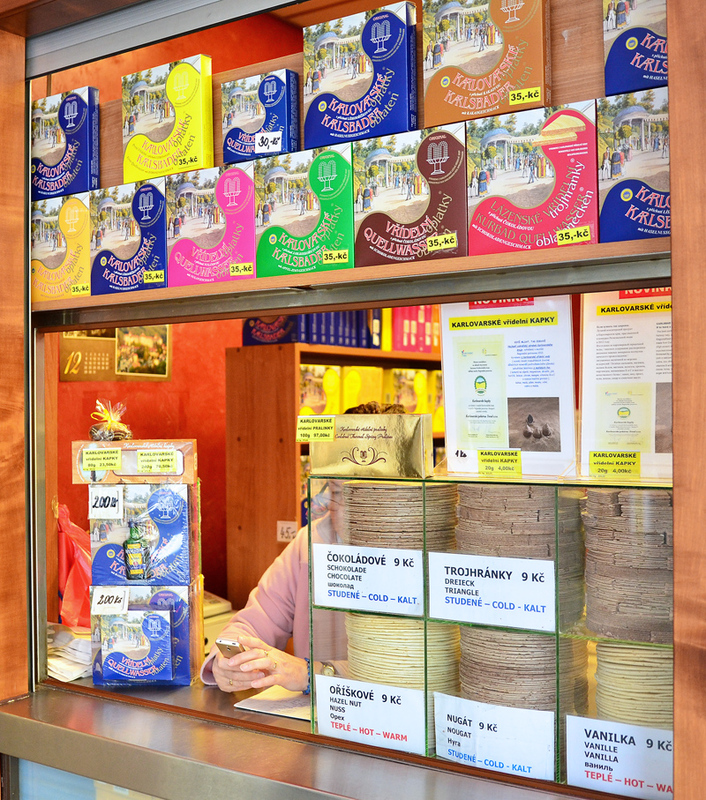 That country gets its own section on the menu, synonymous with pasta. There are lots of sections on this menu, in fact: cold appetizers, warm appetizers (from foie gras to fried camembert), soups, steaks (no less than 6 options), pork dishes, chicken dishes, fish dishes, side dishes (fifteen of them, half are potatoes), fresh salads, light desserts (such as profiteroles), and — my favorite — “remarkable dishes for true gourmets” (which evidently means things like mixed grill, veal Stroganoff, Wiener schnitzel made with real veal, veal cheeks, and the same roast duck you find everywhere else). The duck pâté, though pretty good, should be more aptly called duck liver pâté. 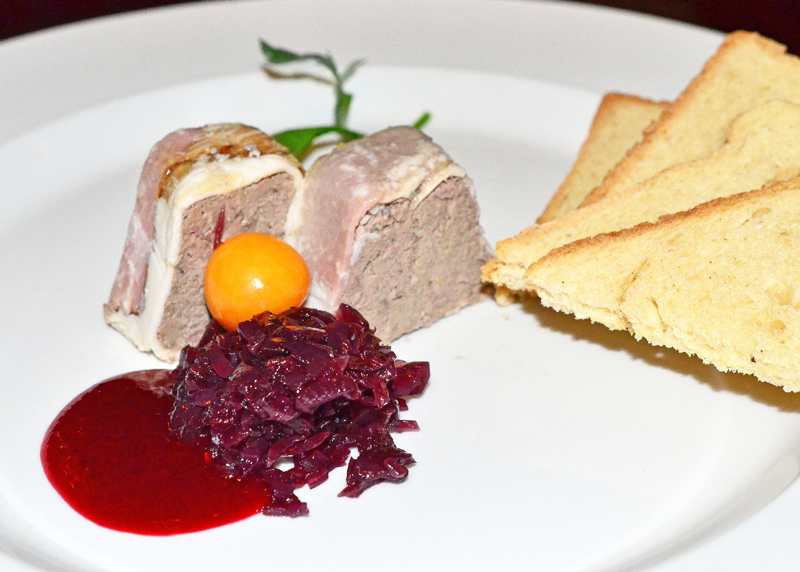 The finely ground forcemeat is wrapped in bacon, served with red cabbage, cranberry sauce, and toast — very classic. Lonely Planet recommends “more inventive mains such as venison ragout”. 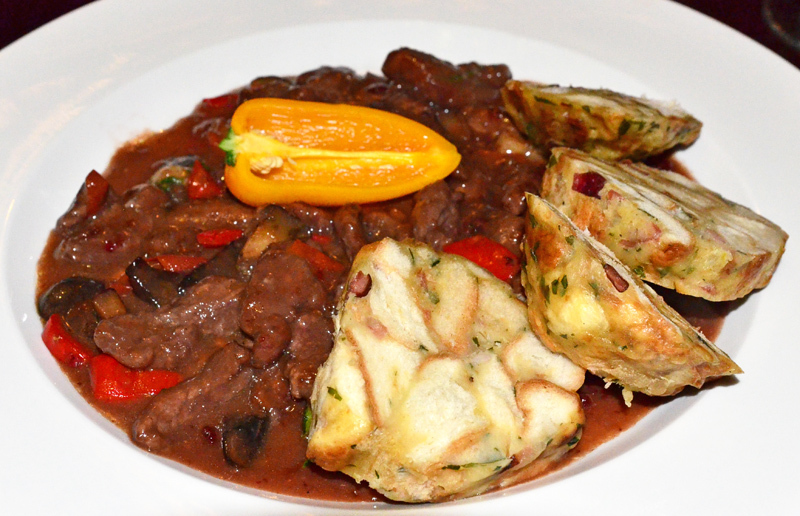 In Czech Republic, I wouldn’t exactly call a meat stew served with bread dumplings creative. Maybe the novelty comes from the zucchini, onions, mushrooms, and red peppers? Zucchini in Bohemia, eureka! The meat is quite tender, but the sauce is very, very sweet, and pretty thick. The menu mentions cranberry preserves, and they must use the whole jar. The dumplings, with the customary herbs, bacon, and fat, are prepared well. Overall, I’m not that impressed. Unless you’re adamant about meeting Czechs in their natural habitat, Charleston isn’t really worth leaving the touristic bubble of the town center. Looking for a place to rest and warm up at lunchtime? U Švejka is located only a few steps away from the promenade along the Teplá River. 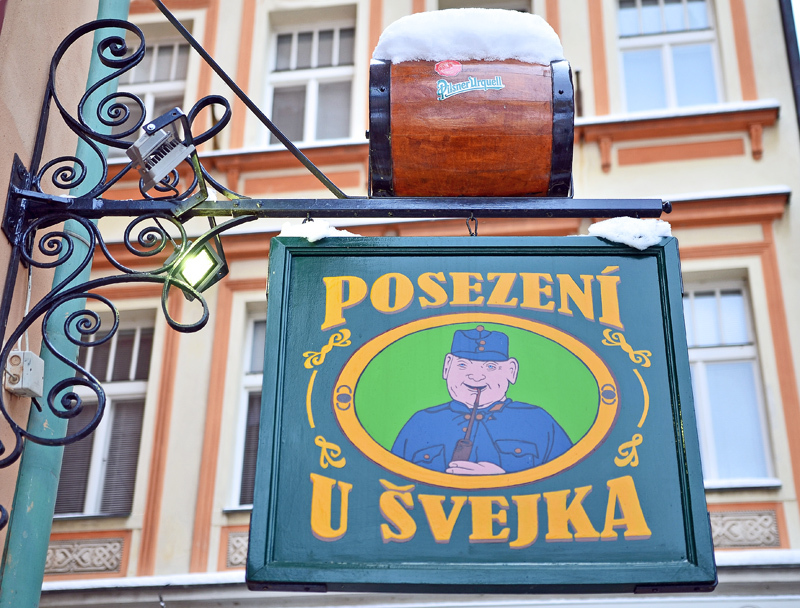 The restaurant is named after the Good Soldier Švejk, the main character of the eponymous Czech novel. 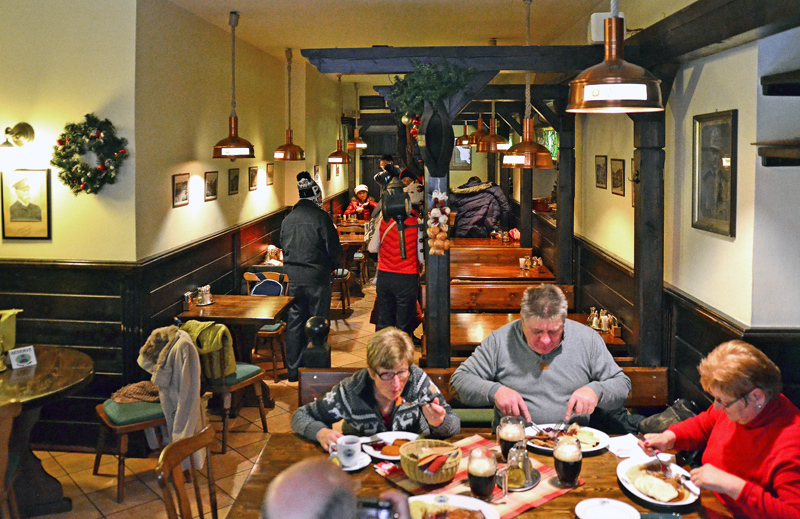 The food is traditional pub fare: ham, sausages, fried camembert, pork knuckle, roast duck, goulash, and game meat. 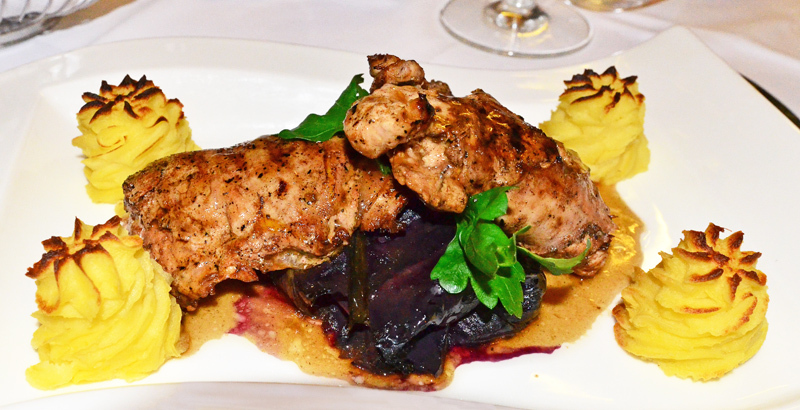 Like many restaurants in Karlovy Vary, I think they also serve grilled dishes in the summer (i.e., steaks and kebabs). 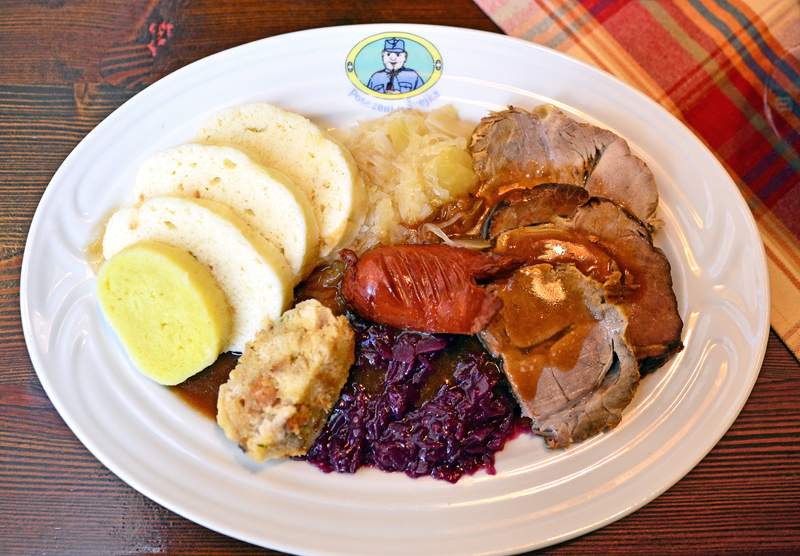 The Old Bohemian Platter easily feeds two, especially the day after the excesses of a typical Czech dinner. You won’t run out of meat or starch, I promise. It follows the typical Vepřo-Knedlo-Zelo model, with each element in multiple versions. There are three different meats: roasted pork, smoked pork, and sausage. Three kinds of dumplings: plain bread (lots of it, pretty boring as usual), potato, and bread mixed with pork fat. Two sorts of cabbage: red cabbage and sauerkraut. This rustic combination is pretty successful. Karlovy Vary nowadays may be a quaint resort town that sees lots of tourists, but nobody goes there for the gastronomy. Then again, many people go there for all the wrong reasons — drinking that vile water didn’t give Peter the Great robust health. Until I venture to Czech Republic again, this ends my Czech Impressions series. But there are many more places to explore, and dishes to try, so rest assured that this is just the beginning. In the meantime, my next travel posts will take you to… Central Asia!